This camera outlines the dangers of buying online. One is reliant on the written description given by the seller and a photo or two. Unfortunately, it is just not possible to physically examine what you are buying. In this case, the camera was described as 'good and clean' with the seller saying that they knew nothing about cameras and so could not comment on functionality. That last should have been a red flag to me - anyone can press the shutter release and tell if anything happens or not. Similarly, other controls either turn, press or not and any seller can report such. This camera is missing the battery cover which is blindingly obvious on even a cursory examination of the underside of the camera. Less obvious but still well visible is the loose leatherette on the top (not visible in the picture supplied on Ebay) which covers two holes from which the screws have been removed. Clearly, someone has attempted to take this camera apart. The seller? Or did the seller buy it in this condition and try to pass their mistake on? I cannot know which but a small honesty on the part of the seller would have saved me buying an unusable camera. I could have taken this up with Ebay but the cost to me was less than £10.00 including postage so it is not a major issue. I just do not like people being dishonest with me and they now have a negative feedback for their troubles. As to the camera itself, there is much to admire. 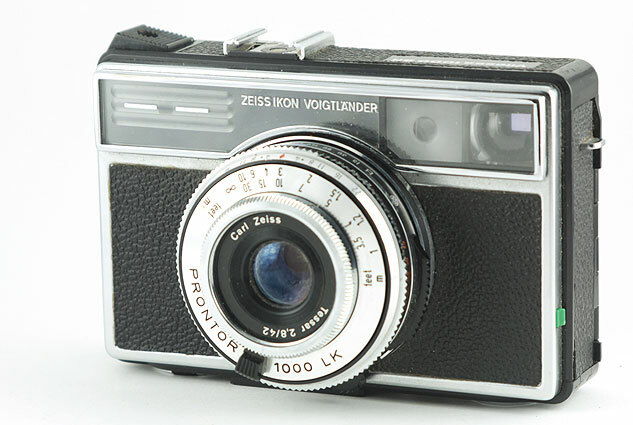 This model is one of the last engineered German cameras - Leica excepted - before Japanese plastic took over the world. I don't mean that in a derogatory way as Japanese plastic has much to recommend it if only in weight. This camera is heavy and you are not going to forget that you are carrying it. The three main controls are easy to find by feel - at this time Zeiss Ikon had taken to putting plastic tabs on the focussing ring, aperture ring and shutter speed ring. The aperture ring is between the other two and has the widest tabs. The shutter speed ring is closest to the camera body and has tabs that extend to less than half the circumference of the ring. The focussing ring is at the front and has only a small tab at the bottom below the lens. This set-up means that it is easy to find the correct control by feel - the values are repeated in the viewfinder with a rangefinder spot in the centre for focussing. The rangefinder is the worst aspect of this camera - the rangefinder spot is fairly small and quite faint. It works fine but could be easier to use.